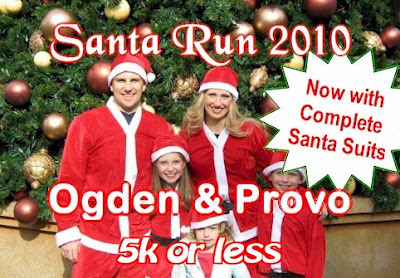 I've registered to run the Provo Santa Run which is a 5K. This is the first time I've ever attempted such a thing. So now that I'm committed to this run I've started to get more nervous about it all. On Monday night I decided that I needed to get another run in at the gym. I like to get a treadmill where I can see myself in the mirror straight ahead. I try to zone out just staring at my reflection in the distance. On this occasion there were some abs machines in front of me. Halfway into my run two young women started using one of the machines and while I was not watching them I'm sure that it looked like it. In my peripheral vision I would notice them looking into the mirror at me and then after a while they would turn around and look at me. I found it a little amusing. I did my best to just ignore them but they were definitely distracting. I kind of wanted to let them know that they weren't that attractive but I thought better of it. Way to go Brian. I keep thinking I'd like to try running but just can't get committed!